Hey everyone! Today I wanted to share with you a fresh and simple makeup look to easily brighten up your face. When Spring comes around, all I want to do is clean up, cut back, and streamline my process from my closet to my makeup routine and this is an easy first step. Check out the tutorial below! First a wide, black winged line with gel liner was used on the upper lids. I especially like using gel liner like Bobbi Brown's for this because you can get a really matte look which is always classy when you have a thicker line. On the lower lids I used an Urban Decay 24/7 pencil in Freak to add a pop of unexpected brightness. 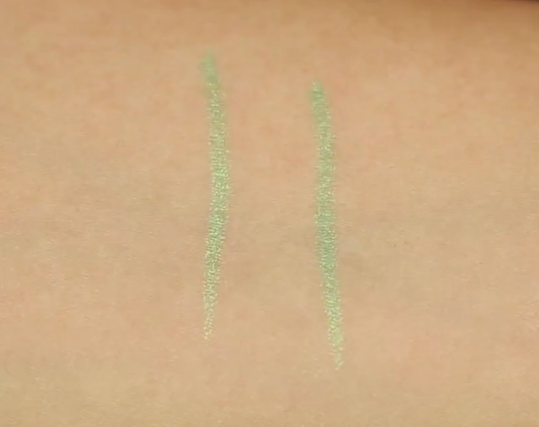 Just to show a comparison, here's a comparison of UD Freak and NYX Slide-On Liner in Green Papaya. I knew they were similar but didn't realize they were nearly identical until they were side-by-side! For the rest of the face, I kept everything warm and natural with a peachy cheek and lip using Clinique's Cheek Pop blush in Ginger Pop (my full review & swatches) and Benefit lipgloss in Poutrageous. Oddly enough, it was a bit tricky to find the right peachy-coral gloss shade for this look since many of my glosses were too pink, but I love how Poutrageous pulled the whole look together without completely covering the shade of my natural lips. A very nice MLBB gloss if I say so myself! Definitely let me know if you try out this look and instagram, tweet, or facebook a photo because I'd love to see it! Readers, what is your favorite spring "pop of color" shade? What tutorial would you like to see next? Let me know in the comments below! Love the pop of green, it's that that makes this perfect for Spring! It's really a very gorgeous look, Jen! Lovely! Your skiing is perfection! Loved the video. so beautiful! i love the idea of a pop of light neon green! love this look! I'm sort of digging mint green right now. Although I don't have anything with mint green, perhaps my next purchase. Great video. I'd like to see a video or maybe a blog post on if you're just starting out with your make-up collection what do you think are the must haves so you don't go broke the first trip out, and then what do you think you should slowly start adding. Very nice look for spring! Diggin' that pop of green Jen! So fresh! ^_^ Loved this! It was perfect for St Paddy's day too! Love it! So pretty! And your shirt is so cute!! Giveaway going on right now on my blog! Find out how to enter! What brush did you use to apply your black eyeliner? what lashes did you use here? love them and love the look! what brush are you using for your concealer? thanks!!!! such a huge fan!!! Hi Jen. May I know what false lashes you used for this spring look? You did not stated the lashes.